I think Squirt is the only one who gets it. He really gets yarn. He is ever grateful for the small private stash I keep in our bedroom, where he can cuddle in it. I think he secretly yearns for the joys of the wood-lined closet in my studio, where yarn for sale is kept, and where cats are strictly forbidden to trespass. 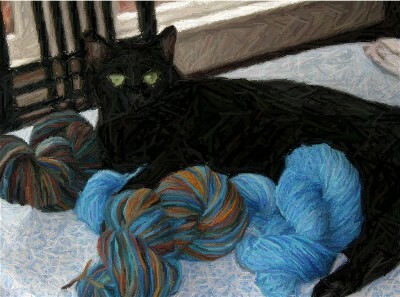 Squirt also gets Ravelry. I’m having a lot of fun checking it out and he likes sitting on my lap and purring — batting at the occasional strand of alpaca — while I get familiar with everything. I don’t think the rest of my family gets it. They don’t seem to understand getting up at 4 a.m. to sign in, coming home from work and going straight to the computer (forgetting to cook dinner), and endlessly photographing stash. I feel sad for them. Squirt and I are having lots of fun, looking at patterns and checking out yarn. Ravelry is Nirvana. If you’re a knitter and you haven’t signed up yet, trust me. You should. In the meantime, there isn’t a lot going on here, other than the fact that I finished my work in Kathy McElroy’s incredibly beautiful Pock-et-ful round robin book, but I was so obsessed with going back to Ravelry that I neglected to photograph it before I packaged it up, and I’m hoping I can prevail upon Karen O to take pictures when it arrives in Atlanta. I promise to surface by the end of the week, after I’ve thoroughly indulged myself by spending my non-working hours um, you know where. Please do stop by and take a look when I stock new yarn, including silk, cashmere, Blue Faced Leicester, and Bamboo sock yarn at Elliebelly on Hyena Cart, Thursday, at noon central time. Here are a couple of the new colorways, "Tonks" and "Cleo," that are joining some old favorites like "Treasure" and "Plum Pudding." The previews are up so you can see it all now. Please drop by for a look! 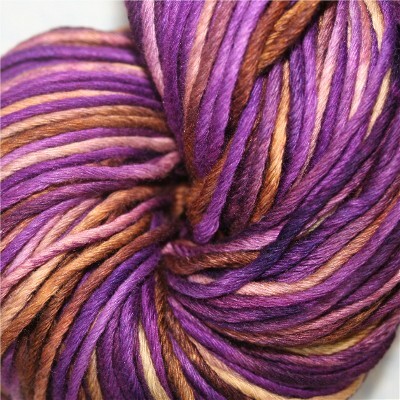 I just got a little choked up when I saw that you named a colorway “Tonks”. I’m such a nerd. I’m sure that Squirt is yearning for opposable thumbs so that he too can knit! What a sweet kitty! I cannot wait for Ravelry! I am about 700 back. I am hoping to be deep in the trenches with you soon! Joyce, your so funny and totally obsessed with yarn and knitting. I guess that’s a good thing, it keeps you out of the kitchen! I’m expecting a new grandson in December. Can you knit him some booties? I can’t wait to see the work you did in my book. I understand this sickness you have, so I forgive you. I’ll just wait for Karen to post pictures. Have fun with your new site. Oh, my gosh, you have more PURPLE yarn….yikes! 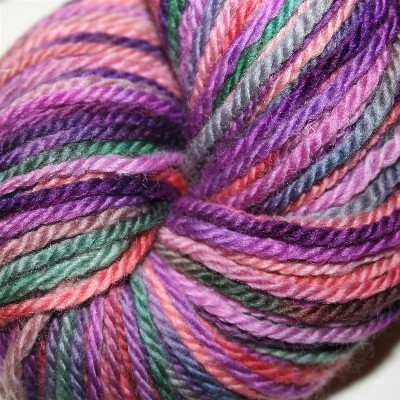 I got the sock yarn today – love the colors. Families are so out of touch with our obwsessions. Sad, isn’t it?